I’ve lost track of how many times I’ve made this recipe – my 16 year old sister loves these brownies and was surprised by how easy to put together they are the first time she saw me making them. It was a hit with my brother and at work, too. I left a comment on Chuck’s post on June, 2008 – that was the first time I baked these. Position a rack in the lower third of the oven and preheat the oven to 160°C/325°F. Line the bottom and sides of a 20cm (8in) square baking pan with foil, leaving an overhang on two opposite sides. Butter the foil. Chuck’s note on chocolate: any unsweetened natural or Dutch-process cocoa powder works well here. Natural cocoa produces brownies with more flavor complexity and lots of tart, fruity notes, which maybe more exciting for you. Dutch-process cocoa results in a darker brownie with a mellower, old-fashioned chocolate pudding flavor, pleasantly reminiscent of childhood. you exactly know what I like! Another wonderful photo - where do you get the patience to wrap individual brownies? I think it's good to have a few recipes which use cocoa rather than chocolate - cocoa is a storecupboard ingredient, whereas I do occasionally run out of chocolate. I intend to try these soon. I saw this in your place today and I went straigt to my kitchen and made this. So wanted to tell you this is one of the best brownie I have made and had. At the moment my daughter is enjoying them fully. I took picture if the picture is good i will post them next week. I've been thinking of making brownies.. and boy, this looks good!! yum! i need a good brownie recipe that only uses cocoa. its going into my bookmarks to try! 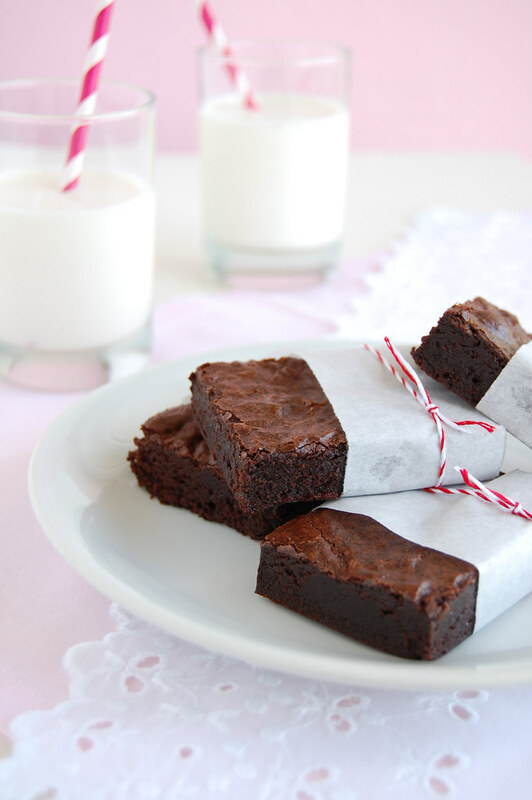 The brownies sound terrific, love the photo, especially how the straws match the little ribbons! Adorable! These brownies look absolutely gorgeous (and delicious, of course). This is a brownie recipe I have been looking for (use of cocoa powder). Thanks for sharing. love the dark rich flavor, but always looking to try something new. Yes please! These look amazing - especially with a nice big glass of milk. These look awesome! Wonderful photo! Oh Pat, the texture of the brownie looks so moist and yummy! A must try recipe indeed. Thanks for sharing. Have a nice day! They do look good. It looks like the texture of these is what I like in a brownie- fudgey. Thank you for a easy recipe, I have tried to bake brownies quite a few times and it's always a fiasco. I can never get the right texture. The gooey creamy texture. I'll try your recipe, it looks delicious. I love brownies,Mmmm!!! They look so good!!!! the brownie looks so chocolately and rich, yummy! Wow, these look so so amazing. I love the dense and fudgey texture -- definitely my kind of brownie! I want to whip these up tonight! So funny! I've planned to bake these brownies this weekend!!! I love your blog! The photos are amazing and all the desserts look delicious! Tks for letting me know - and I'll be delighted to see them on your blog! Alexandra, thank you for stopping by! Leanne, thank you for visiting! Elyssa, thank you for the link! Ube, thank you for stopping by! Jessica, thank you for stopping by! Dear Kristy, thank you! I'm so glad you like them! Lori, thank you! They're really moist. Anna, thank you, darling! Hope you give this recipe a go! Ahn, we're half a planet away but in sync, dearie! Rach, thank you for stopping by! I'm glad to hear that! who doesn't love brownies!! Yours sound heavenly, and I love how you have them wrapped so nicely! You are so right...these are the perfect brownies. Made them yesterday for last nights dessert and they were devoured as I was cutting them. Gorgeous photo! Gotta love a good browny, these look great! Chef Dennis, thank you! I'm glad you like the blog! Susan, you made my day, darling! I'm so glad to know you like the recipe, yay! Daniel, thank you for stopping by! Patty, you are far too sweet, darling! Thank you! Drooooooooool these look SO good! I can see why your sister loves them. Remember me telling you I made the brownie the day you posted it self, just posted them in my place http://mykitchentreasures.blogspot.com/2010/07/best-cocoa-brownies.html I totally agree this is the best ever brownie i have ever made. I am sure this will be made over and over in my place. Thankyou for sharing such a good recipe. Hi, came thru happy cooks blog and how glad am i to have discovereed such an awesome looking blog..loved loved loved ur blog and ur site brownies....and teh presentation....I am following you. WOuld love to have u at my space and hear any suggestions. I'm off to your blog right now - thank you for letting me know! So I've never made brownies from scratch before or with cocoa powder and I was a bit hesitant to try these but I did and oh my goodness... They are SO good. I feel like going out and buying cocoa powder in bulk so I can make these any time, they're that delicious. It's like brownie fudge, yum yum yum. Thank you so much! Alexandria, that is GREAT news! I am so happy to hear that - thank you for letting me know! Thank you so much for posting this. This photo and the coloring somewhat reminds me of Christmas. I truly do love brownies and I'd eat them nonstop. Sickening, I know..but that is LOVE. LOL Been a while since I've swing by your blog. Hugs to your blog and thanks for keeping it wonderful. Ja9, thank YOU for stopping by! You are just far too kind! Added chopped Reeses and that was good too. Will definitely keep this recipe! Hi, Amanda! Thank YOU for letting me know how they turned out! Love the idea of adding Reeses - yum! just came across this blog, and love it! i came by way of foodgawker, looking for the perfect cocoa brownie recipe, and i have found it. i followed every direction to the gram, and they are perfect! fudgy, in the middle (my fave part), chewy on the edges, and crispy on the top. would have waited for them to completely cool through, but my two-year old came by and took a handful out of the middle. heavenly! have a lovely day! WOW... I've never seen such a great foodblog that has so much to offer - especially on the sweet side. I'm so addicted to these brownies...just took out a new batch from the oven now... GOT MILK? I don't think I've ever followed a foodblog other than yours... my sister is a fan too - she tasted the first batch I made and asked for the recipe, which I referred to your site. Oh yes, I am also copying the way you wrap these brownies for the holidays...THANKS! Hi, Rachel! I'm so glad to know you and your baby liked the brownies - tks for letting me know! Fides Nuqui, you are far too kind! Thank you! I'm glad to know you're enjoying the recipes here! Hi! Thank you very much for the recipe. And could you please tell tell me whether I must butter parchment baking paper or not if i use it instead of foil to line the pan? Is it stick if I don't? (I just started with baking, so I don't have much experience with it). You should butter the parchment paper, too, otherwise it will stick. I hope you like the brownies! Thank you for letting me know how the brownies turned out! My younger sister who is also an excellent cook & a baker by hobby was responsible in pointing me to this website for the no fail, moist chocolate brownie recipe that I have been searching for. This has been my go to recipe whenever I need to bring some over at work or to a holiday party. I sometimes add 1tbspn of espresso powder with this recipe. and as a shortcut, I just melt the unsalted butter in the microwave and use a whisk to prepare all of the ingredients. It always comes out moist & chewy, just like a prefer my brownie. Thank you for sharing your recipe. I'm a big fan! I am so glad to hear you like the brownies - they're my sister's favorite! Thank you for the inspiration Patricia! What beautiful photos! I have adapted this recipe to make Caramel Brownies which have turned out delicious! I have posted to my blog and linked in your post! I hope you don't mind!